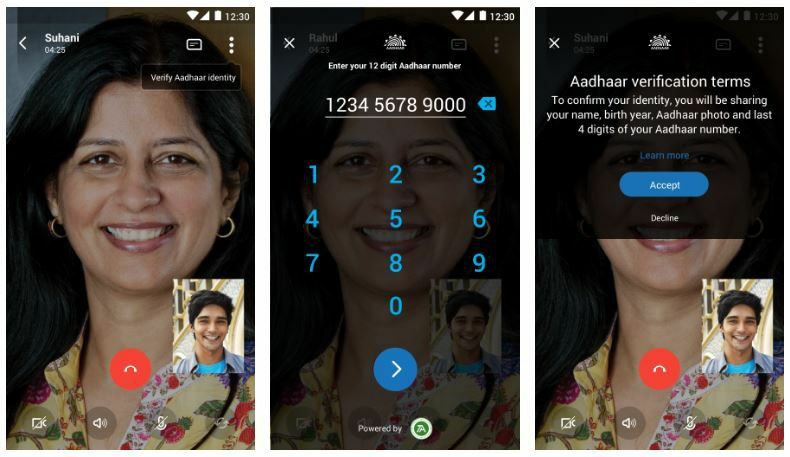 Skype Lite app now support Aadhaar features in India. Announced in February, the Skype Lite is a fastest and smallest app built for the Indian market. Aadhaar is the world’s largest national identification number project and allows users in India to communicate with government, business, and others with a higher level of trust and lower potential for fraud. The new Skype Lite app can be used to verify users’ identity online, helping them communicate more securely with others with the Aadhaar integration. For example, you may wish to make a Skype Lite call to an important business client or government representative – by using Aadhaar, both parties can verify their identity at the beginning of the call to prevent impersonation fraud. In order to confirm your identity, you’ll need to click on “Verify Aadhaar identity”, enter your 12-digit Aadhaar number and then authenticate with a one-time password sent via SMS. Once validated, you can choose to share pre-selected Aadhaar information with the other person to confirm your identity. According to the Microsoft, Skype will not store any Aadhaar information and your personal information is securely encrypted. You can download the app from Play Store or from here.